Can Infrared Cameras See Through Walls? 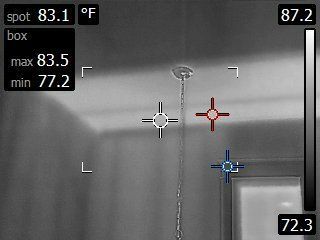 We have discussed this subject before, but every once in a while, I talk to a Real Estate Agent, or consumer who has been led to believe that infrared cameras can see through walls. Recently, this incorrect ability came up during a discussion with a potential client. It seems the home buyer had been mislead by another home inspector who promoted his infrared (IR) camera as having the ability to see through walls. I cannot say if the consumer misunderstood what the inspector was promising, or the inspector “over sold” the capabilities of the tool, but either way, that consumer was adamant that the infrared camera could see through walls. True or False? Infrared (IR) cameras can see through walls. 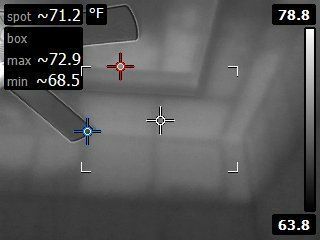 Let’s just set the record straight, in simple terms: An infrared camera cannot see through walls, an infrared camera sees the wall surface temperature. An infrared camera is a non-contact device that detects infrared energy (heat) and converts it into an electronic signal, which is then processed to produce a thermal image on a video monitor and perform temperature calculations. Heat sensed by an infrared camera can be very precisely quantified, or measured, allowing you to not only monitor thermal performance, but also identify and evaluate the relative severity of heat-related problems. Infrared cameras are tools that can be helpful in identifying insufficient insulation, or areas of air infiltration or active water leaks or moisture intrusion, but the camera only sees surface temperature, so the inspector needs to be properly trained in assessing the camera images. Each Beach To Bayou inspector carries a hand-held IR camera, that we use when conditions dictate the need for a thermal evaluation. We don’t charge any extra fee for the use of the camera, just as we don’t charge any extra to use a flashlight. To us, an IR camera is just another tool in our tool bag,and we use it when appropriate. If your current home inspector is promoting an infrared camera that can see though wall; or charging extra to use this common tool; perhaps it is time to call Beach To Bayou Property Inspections. Please provide your name and email so we can contact you if you're the lucky winner! You don't even have to get it right to win! Yes, subscribe me to the list so I receive future Inspection Questions. We promise to never spam you or share your info.